Networking, collaboration, and meeting new people to help with ideas and business concepts can be difficult if you work at home or if you’re stuck in a cubical all day. It’s up to you to make the most of your career and to reach out to others. John Hargrave, author of MIND HACKING, shares 3 great places to inspire collaboration. Many of us have to force ourselves to collaborate. While technology makes it easier than ever to isolate ourselves, becoming lost in our screens even when we’re sitting across the table from each other, technology also makes it easier than ever to connect. Joining discussion groups and online forums where we can collaborate with others who are trying to achieve the same goals is a good first step, but it’s even more powerful to do it in person. Here are a few easy ways to build collaboration into your life. There are other people near you, right now, trying to accomplish the same goals. Do a search for “entrepreneur networking” or “weight loss groups” or “local salmon farming classes,” and unless you are living on the International Space Station, you’ll find a group meeting near you. Be brave! Put it into your calendar and make the time to go. If I’m wrong and there is no group near you, start your own. The Web Innovators Group started as an informal gathering of a dozen people in 1995, and it is now one of the largest technology networking groups in Boston, drawing a thousand magnificent minds together in a huge, sweaty hotel ballroom. If you work from home or by yourself, consider using a coworking office instead, where you can bump into knowledge workers from other industries, giving you fresh perspectives and new ideas. Shared workspaces are cropping up in every major city: they’re comfortable, affordable, with unlimited coffee. I’m writing this from the Writers’ Loft, a shared space outside Boston started by my friend Heather Kelly. Writing around other writers means I get more quality writing accomplished here than anywhere else. Make it a habit to invite potential collaborators to lunch. Mix it up: Ask different people with different backgrounds. I once worked with a group of IT admins who ate together at the same burrito place every day. They were like gang members, except their turf was Qdoba, with goatees instead of guns. They were also terrible IT admins; trying to get help with a support ticket was like trying to negotiate a Middle East peace accord. I often thought that if they had to eat lunch with people from other departments, they’d be better at their jobs. Meals let us connect with other minds in a pleasurable setting, because everyone loves to eat. Especially IT professionals. We can’t expect collaboration to come to us. As with Pixar, we have to design our lives so that collaboration can naturally happen. The ideas above are just meant to get you started, but if you keep your eyes open, you’ll find other ways that collaborative opportunities will naturally present themselves. Take advantage of them. Discover more ways to network and collaborate in MIND HACKING by John Hargrave! For more on succeeding in the workplace…. Excerpted from Mind Hacking by John Hargrave. Copyright © 2017 by author. Used by permission of the publisher. All rights reserved. Have you ever wished you could reprogram your brain, just as a hacker would a computer? 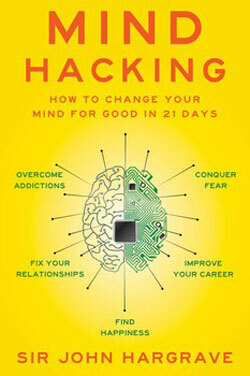 In this 3-step guide to improving your mental habits—using plenty of clear “computer-related terms should resonate with tech-savvy readers, including those resistant to typical self-help fare” (Publishers Weekly)— learn to take charge of your mind and banish negative thoughts, habits, and anxiety—in just twenty-one days!A seasoned author, comedian, and entrepreneur, Sir John Hargrave once suffered from unhealthy addictions, anxiety, and poor mental health. After cracking the code to unlocking his mind’s full and balanced potential, his entire life changed for the better. In Mind Hacking, Hargrave reveals the formula that allowed him to overcome negativity and eliminate mental problems at their core. Through a 21-day, 3-step training program, this book lays out a simple yet comprehensive approach to help you rewire your brain and achieve healthier thought patterns for a better quality of life. It hinges on the repetitive steps of analyzing, imagining, and reprogramming to help break down barriers preventing you from reaching your highest potential. By treating your brain as a computer and mastering Hargrave’s mind hacking formula, you, too, can create a positive, permanent shift in your thinking, leading to personal and professional triumphs in all areas of life.